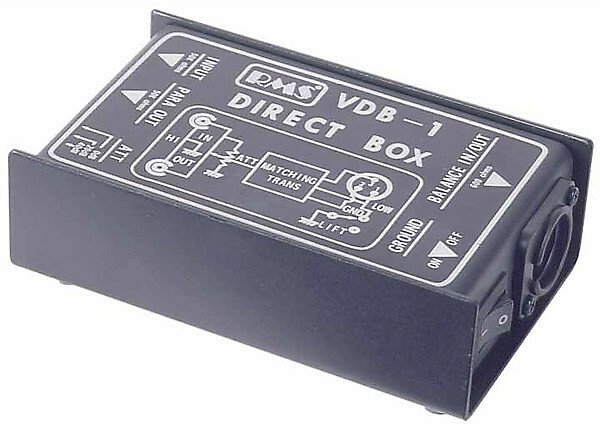 The RMS VDB-1 Direct Box enables the connection of any high-impedance unbalanced audio source signal such as an effect pedal to any low-impedance mic-level balanced PA input. Its parallel output allows the simultaneous connection to 2 separate inputs, connect to your amp and a PA. A 3-position input attenuation switch (0dB, -20dB, -40dB) facilitates optimum level matching to connected equipment, and a ground lift switch eliminates ground loop-induced hum. The VDB-1 is rugged, roadworthy all-steel construction assures you years of continuous reliability. Items ship the best rate using either USPS, UPS or FED EX. Most items are packed and leave our store in one to two business days and take 1 to 10 days for delivery. We ship ground delivery unless otherwise directed. Some shipments may be shipped directly from manufacturer to you. Returns of merchandise within 15 days of received gets full refund excluding the shipping and handling charges. if the item was marked FREE SHIPPING a standard USPS shipping fee will be deducted from the refund. Defective merchandise will be exchanged for full refund and shipping charges or exchange for the same product. All exchanges and returns must be requested within 15 days of receiving your order. No refund after 15 days. Please contact Drums Etc. (800)922-3786 for a no hassle return authorization number and instruction. All returns and exchanges should include a return authorization number.